I came across this model on http://tga.community and loved the effects Chris has managed to achieve on the model. The highlights on the armour and skin really impressed me and I wanted to find out more on how he created them. 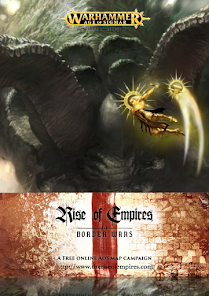 TGA or The Grand Alliance Community is a great place for Age of Sigmar at the moment, created by Ben off of BadDice podcast, it is a forum, blog spot, gallery and event holder full of people who love Age of Sigmar. I also managed to get a few questions answered by Chris to find out a bit more on techniques and himself generally as a hobbyer. Sean: Hi, thanks for taking time to answer some questions and tell us about your miniature and hobby, firstly; What's your real name? Chris: Hi, thanks for inviting me to talk about my Nurgle Lord of Plagues. My name is Chris Bainbridge and I live in Sigmar’s heartland Nottinghamshire, UK. Sean: What made you want to paint this model, or choose Papa Nurgle? Chris: The Lord of Plagues model has been out for a while now and while I’ve always really liked the look of him I had no incentive to pick him up, as I don’t have a Chaos army (yet). When GW released Warhammer Quest: Silver Tower it provided the perfect excuse to collect whatever cool looking character I wanted. For me this was the Nurlge Lord of Plagues and a Bloodbound Slaughterpriest that I’m now working on. 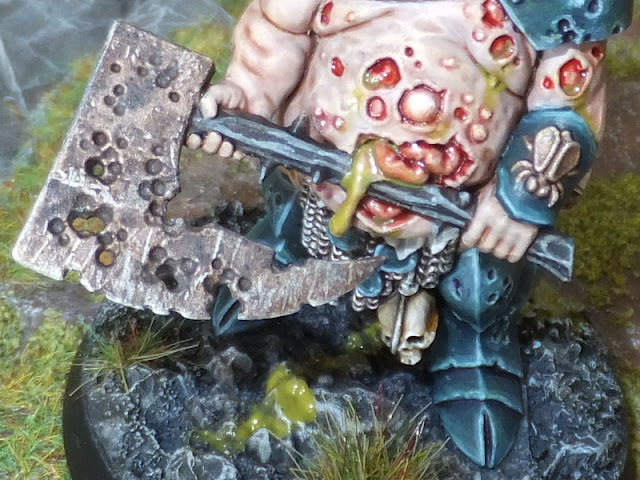 Sean: The colour tones are absolutely fantastic, what is your recipe for the Skin and Gore? Chris: The Lord of Plagues is actually an incredibly simple model to paint as it is mostly flesh and armour and the way the model is posed makes every area of the model easily accessible when fully assembled, (I hate painting bits separately). This is the first model I’ve really painted with pale skin and gore so I don’t have a recipe as such, but this is what I did: The flesh (including the sores) were painted with Vallejo Extra Opaque Heavy Warmgrey, then dry brushed with GW Terminus Stone, then washed with GW Reikland Fleshshade. After the wash was dry I reapplied some thinned Heavy Warmgrey on the raised areas to neaten up and I used a bit of GW Pallid Wych Flesh to highlight. The sores and spots were outlined by painting some GW Carroburg Crimson around the edges. Lastly, after painting the rest of the miniature and giving it a protective matte varnish I tried out the new (to me) GW Technical paints; Nurgle's Rot and Blood for the Blood God. I applied a coat of each over the slime and sores respectively. The axe head was painted GW Ironbreaker followed by a liberal coat of GW Typhus Corrosion. While this was drying I used a wooden toothpick to scratch off bits of the drying darker colour to reveal the metallic below, an easy way to produce a battered look. Sean: What are you most motivated by in this hobby? Chris: That is a really good question as I don’t get to game as often as I’d like. So for me I guess the motivation comes from seeing cool new releases and pictures of different peoples great looking armies, with different themes and colour schemes. Sean: What is the Age of Sigmar scene like in your area? Chris: Well; I live within an hours drive from Warhammer World so I would imagine the scene is pretty strong, but in truth I’m stay at home hobby gamer and only really play with my brother when he comes over. Unfortunately he’s not taken so well the the destruction of the old world so we play less than we used to. Chris: I’ve been in the hobby since around 1995 after purchasing the 2nd edition 40k boxed set (for the Space Marines) before moving primarily onto fantasy in around 1997 with High Elves. Although I did have a hiatus from the hobby to study Physics at university in the mid 2000's. 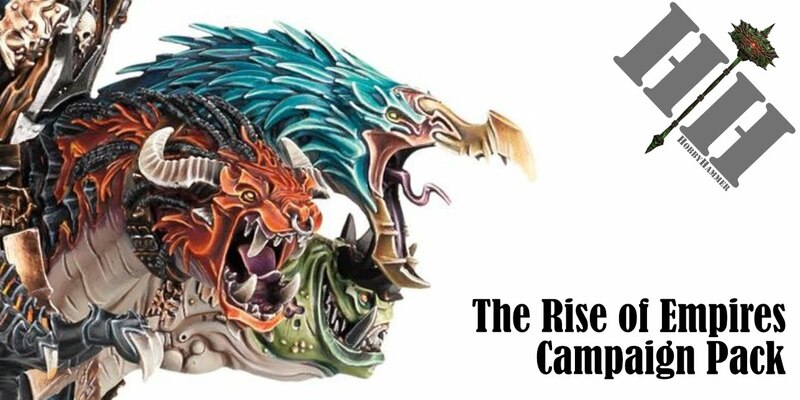 Sean: Are you going to be participating in the upcoming Summer campaign from Games Workshop? 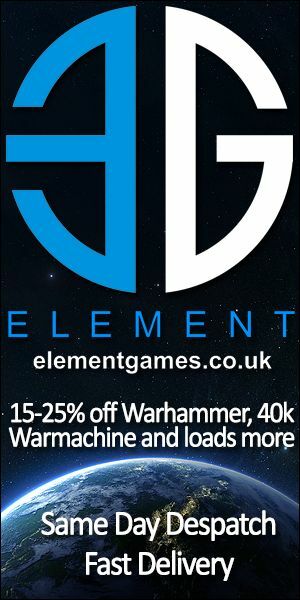 Chris: Probably not, I have no idea how these sort of campaigns work, but it will be interesting seeing what it’s all about and what new content/miniatures are released. 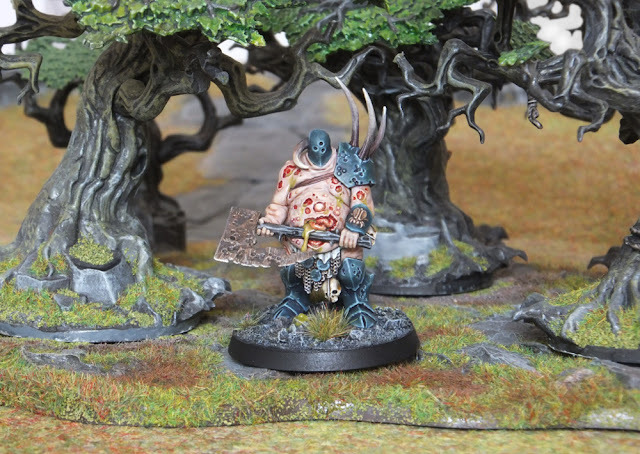 Chris: You can see more of my miniatures on Cool Mini or Not and my blog on tga.community. I’m always happy to answer questions about my miniatures and as I’m looking to try and paint to a higher standard I‘m keen to hear any tips or critical feedback people may have for me. Thanks again for having me.